Thank you for the great interest you have shown on my new system: the Ultimate System for All Even Bets. This week, I would like to share my answers to all your frequently asked questions about it. Q: How much is the lifetime bankroll for it? (I know that the session bankroll is 120 units). A: I wouldn't allow more than two back to back losses with this system. Therefore, a 240 unit lifetime bankroll is quite sufficient for Roulette. Q: If the biggest bet while testing it for roulette has been 45 units, does this mean it's another up-as-you-lose progression system? A: There is a large chunk of the system, that goes almost with flat betting. However, if there is a long sequence of losses, the system switches to higher betting amounts, not necessarily progressing from one bet to another in order to close the run with a profit, and this profit is not necessarily only 1 unit per run, but can be also multiple units up to 30-38 units. Q: In roulette, "it made 1 unit every 10 spins." So, about 5 units/hour, on the average. One would have to play with at least $10 units to make it worthwhile, which equates to a $1200 session bankroll. that's feasible; eventually progression to $25/units is an enticing goal, but once again, the lifetime bankroll calls for ??? at least 6K, or so, at that level??? A: $1200 session bankroll for $10 bet unit size is correct. Since the lifetime bankroll is 240 units, this calls for $2.4K not 6K. Q: In baccarat, I estimated from your data that it made a unit per 12-13 decisions. so, about 5-6 units/deck, is this about right? Once again, good profits at $25 level, and would think progressing to $50 within a month or so of part-time play is a reasonable goal, right? A: In Baccarat 3213.60 units are generated within 41,007 decisions or 600 shoes. This makes an average of 5.35 units per shoe, which has 80 decisions or 1 unit each 15 decisions. At $25 unit size, this makes $134 per shoe or per hour, since a shoe takes about an hour to play. If one plays 5 shoes a day, this can amount to a profit of $670 a day. With this kind of profit, one can easily upgrade to $50 a unit size within about a week of using the system and double the profit. Q: You've tested this system against the baccarat, craps and roulette tester books, which is great; however, I'd like to see the worst possible scenario in something like 250,000 decisions to feel confident about risking my money with it. What's you total number of decisions so far? A: The Zumma tester books are limited to 15,000 spins in Roulette and 41,007 decisions in Baccarat. However, I included in the package a simulator for random spins, which one can run as many times as one wishes. The simulator is for 1000 spins. To get 250,000 decisions, you need to run it 250 times and record each result. You can also replicate the last line of the Excel simulation up to Excel's maximum of 65,000 decisions and run the simulation only 4 times to obtain the quantity of the tests you require. You can also run this test multiple times. You will not receive the same results every time, since the outcome is random. However, you will see a steadily increasing graph at the result of each simulation with slight drops every time a session loss limit is reached without disrupting the average profit of 1 unit for every 10 spins. Q: Does this system beat the Zumma 1000 book? The Zumma 1000 book is much harder to beat than the 600. A: Yes, it does. It generates 259 units for the first 500 shoes and another 307 for the second 500 shoes, totaling 566 units for the 1000 shoes. The reason it's split is because the Excel simulation can hold only up to 65K decisions. Q: What's the biggest drawdown against the Zumma 600 bac book? A: The largest drawdown for the Zumma 600 shoes was 42 units without commissions. Q: What is the biggest drawdown against the Zumma 1000 shoes? What is the biggest bet against both the 600 & 1000 shoes? Are the units calculated net after commission against both testers? Or is it before commission? A: Tests were run with and without commissions for Baccarat. The without commission option matches a game such as Craps or Sic-Bo, since there are no zeros and no commissions in those games. 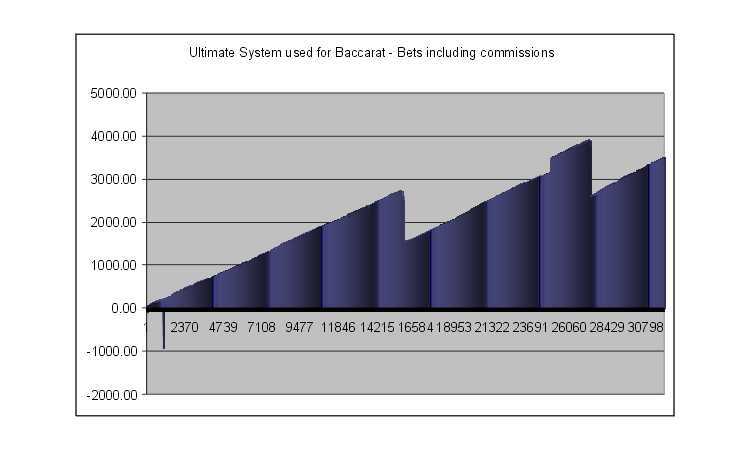 Different parameters give different results for Baccarat with and without commissions. For the 600 shoes without commission, a maximum bet of 29 units and a largest session bankroll of 58 units produces a net gain of 996 units, a maximum profit level of 1197 units with a highest drawdown of 42 units. For the 600 shoes with commissions, a maximum bet of 994 units and a largest session bankroll of 1988 units produces a net gain of 3213.60 units, a maximum profit level of 5497.85 units with a highest drawdown of 1552.90 units. As a very aggressive mode, for the 600 shoes with commissions, a maximum bet of 10000 units and a largest session bankroll of 20000 units produces a net gain of 27078.10 units and this is also the maximum profit level with a drawdown of 1552.90 units. For the 1000 shoes, the first 500 shoes, without commissions, a maximum bet of 20 units with a largest session bankroll of 40 units produces a net gain of 259 units with a maximum profit level of 542 units with a drawdown of 159 units. For the 1000 shoes, the second 500 shoes, without commissions, a maximum bet of 1000 units with a session bankroll of 2000 units generates a net profit of 307 units with a maximum profit level of 1210 units with a drawdown of 7139 units. The maximum bet for the 1000 shoes, that took a drawdown of 7139 was 720 units. Q: This system seems very interesting. Is it possible to play this at online casinos? Q: You mentioned the system handles all patterns. You failed to mention the 2-1 pattern, which is probably the most common in Bac. How does it do on that pattern? A: The 2-1 pattern will produce 2 wins in 6 bets, which will be taken care of by the method. So continuous 2-1's, i.e. B B P B B P B B P ,etc. or P P B P P B P B B, and analogous patterns in Roulette and Craps and Sic-Bo, will end up in profiting runs. Q: Zumma Craps Tester has 10626 decisions and represents 300+ actual hours of live craps. Your post dated 04-02-07 17:56 indicates that with maximum bet of only 10 units, session bankroll 20 units, profit achieved is 1 unit for each 5 line decisions in average. This translates to 2125 units for the tester book. Can you indicate what is the maximum drawdown in units for the tester book. Is lifetime bankroll of 40 units enough to win 2125 units for the decisions in the tester book? A: I do not have the entire Zumma Craps tester book electronically available. I only punched the first few Line Decisions, which gave the above result. If the same trend continues, then your estimate will be accurate. In order to confirm that, I created a simulation for 10,000 random Craps Line decisions, as Zumma would produce only one fixed result, whereas running the simulation numerous times, one can get a good average profit. Thus, the simulation shows an average profit of 430 units for 10,000 Line decisions. http://www.letstalkwinning.com/Ultimate-System-10000-Random-Craps-Decisions.jpg for you to see. This is achieved with a maximum bet of 10 units. The maximum drawdown was -28 units. Q: Izak, you said: "One other way to handle commissions is to add 5% to your play when you're betting on Banker. This way, when you win, you get the full amount you are aiming for. If you lose, you register the amount of loss in the tracking of the net balance for the run and adjust the appropriate progression accordingly." Well, this is always the way I handle Baccarat commissions whenever I play that game. I never choose to have 5% taken from winnings. Izak, I feel this is important for future potential buyers of the system. Can you retest the Baccarat Zumma decisions based on this other way of handling commissions, i.e. adding 5% to banker selection stakes? Thanks. A: I implemented the adjustment. The results are much better. A maximum bet of 482 units generated 2811.31 units with a maximum total drawdown of 936.86 units. The betting of 482 units happens only in 4 instances within 41,007 bets. For the first 1000 decisions, the bets do not go higher than 20 units. 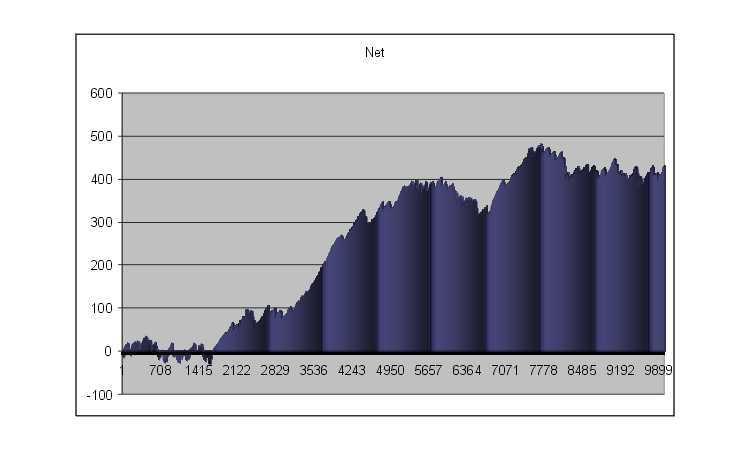 Some bets escalate later on in order to close that run with a profit as well. The first 200 units are made with bets not exceeding 20 units tops. I appreciate you for formulating the ultimate system which requires ultimate thinking process. I liked the bet selection which is phenomenal, but when the betting method is concerned, it is highly slow. A person has to devote a very longer period of time patiently to attain a few units profit. In my case, I could not spend such a long time in casino to sit and profit a few units, because the expenditure for one day will be more than what I may get from the casino. In the last three days, I was working on paper how to get good result with your Ultimate system. I have come with a new idea. It is working wonderfully. THE METHOD FOLLOWS LIKE THIS.....I used same bet selection in ULTIMATE system and I used IBS3 BETTING METHOD. I took all toughest shoes in baccarat which needed higher bankroll and highest drawdown, I tested manually all day and night which has won all tough shoes with minimum bets ., say highest bet not exceeding 21 UNITS. The profit rate shows 20 to 25 units per shoe. [WHAT A GREAT ACHIEVEMENT]." First I tested with Zumma 600 shoes from IBS3 SIMULATOR, this new system has produced mind boggling profits. As I said earlier, 20 to 22 units profit has been achieved in easy going shoes. I took the shoe no. 17 and 18 which has 42 decisions from the ibs3 simulation with maximum drawdown of 96 units. Using ultimate bet selection, I won the shoe with 10 units profit with only 6 units drawdown. I took the tough shoe no. 45 and 46 which has got 52 decisions in Ibs3 system with maximum drawdown of 210 units. Using ultimate bet selection, I won the shoe with 22units profit with 8 units drawdown. Usually all the mechanical systems fails at one particular point, when it exceeds the table limit. But in the case of this system, when ultimate bet selection is combined with ibs3 bet method, the combination becomes solid and adds more strength to the players advantage. One more advantage, which I want to highlight is, the baccarat has low house advantage [1.28%], so the success ratio has becomes 99.99% when compared with other casino games. Thus every gambler's dream of winning in casino becomes true. Happy winnings to everybody.... and thanks to Izak as well." Click here to order for an email delivery of the system. You can have a printout with regular air mail delivery for $5 extra for printing, shipping and handling.